This post is now out of date. Be sure to check out EF 4.3 Beta 1. This post is going to walkthrough what it looks like to use migrations without the magic, a.k.a “Rails style migrations”. Code First Migrations also doesn’t lock you into one approach so you could always decide that you trust the magic in the future, or you can trust the magic for certain migrations. One HUGE CAVEAT on this post is that all the scripts are going to be in SQL… one overwhelming bit of feedback we’ve heard is ‘get rid of the SQL… give me code’. You’re probably scratching you head asking ‘what exactly where those guys thinking when they used SQL scripts?’… we were thinking that folks would be more comfortable with the magic and that adding ‘custom scripts’ was going to be reserved for complex migration steps when you would likely need to drop to SQL anyway. Looks like we got that wrong (but that’s exactly why we ship CTPs). The plans we have around a provider model would make it very easy to swap in some other means of expressing the non-magical migrations… based on what we are hearing it looks we should be using code instead. Scaffolding custom script by comparing current model to database. This adds a Migrations folder to our project with a sub-folder representing our script. The folder contains our script and also a Target.xml file… the Target.xml file is there to facilitate downgrade with automatic migrations… it’s always there in the CTP but in the next release we’ll only leave Target.xml around when you are actually using automatic migrations. The script is scaffolded with what migrations would have done if you wanted it to run automatically… I won’t cover the SQL vs Code point again here, see the top. I could edit the script at this point if I don’t like what it is doing. The script is quite verbose too… I’m just showing the bit that actually creates our table (Beware: Don’t try and remove all that SET <blah, blah, blah> stuff from the script… did I mention this is a super early preview). There is also a create statement for the __ModelSnapshot table which is how the database knows what version it is at etc. 1 pending custom scripts found. - Executing custom script [20110730045135_InitialCreate]. Ensuring database matches current model. - Database already matches model. 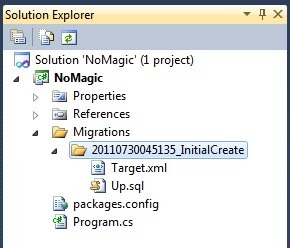 Update-Database : Cannot open database "NoMagic.MyContext" requested by the login. The login failed. Login failed for user 'REDMOND\rowmil'. Ok, so the error is an annoying bug… but everything actually worked ok. It errored out during the automatic upgrade process… which wasn’t going to do anything because we aren’t using the magic. You’ll get this error when you run the first migration against a database that doesn’t exist. Migrations will actually create the empty database for you… is that more magic that you should be able to switch off? One thing that occurred to me while writing this post is that it would be great to have a way to prevent the automatic pipeline from ever kicking in just incase I accidently let it do something. Sounds like we need to have some settings defined in an xml config file your code. That’s pretty much it, we just repeat that process indefinitely. You’ll notice that migrations has added a Model.refactorlog file to your project… Model.refactorlog shouldn’t be there since we scaffolded a script rather than doing an automatic upgrade… another CTP thing that we’ll fix. 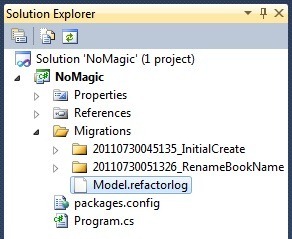 - Executing custom script [20110730051326_RenameBookName]. - Caution: Changing any part of an object name could break scripts and stored procedures.